The Millennium Series is proud to announce that Lars Herzig will continue throughout 2015 to work as the Media Coordinator for us. This will be his anniversary 10th season for him on the job! Lars is the main contact for ALL media, especially the ones from within the paintball industry such as magazines, online forums, blogs, photographers, and DVD production companies. Lars has been involved in paintball since 1991, playing with teams such as ALL STARS in Germany and has 20 years of experience in the paintball industry, first working as freelance editor for various German and European paintball magazines plus consulting for various paintball companies and later becoming chief editor of German magazines "XTREME" and "PAINTBALL 7". 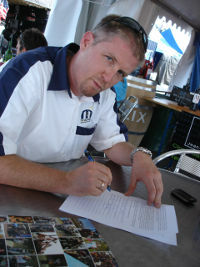 In 2000 he founded PAINT XTREME, nowadays one of the very well known European distributors for various brands. With this background and his language skills we know of nobody better than him to make sure the media representatives of the paintball industry feel comfortable and produce the best content for the best Paintball Series in Europe. For The Millennium, Laurent Hamet commented: "It's great to know Lars is part of the team again. We work for so many years now together - it wouldn't only be us, but most of all his customers, the paintball media, that would miss him. Being a player and a member of the industry himself, Lars knows what counts and his feedback is very valuable to the Board of the Millennium. We look forward working again with him to make sure the media is happy and produce the content we all want to see about the Millennium Series and Paintball in general".